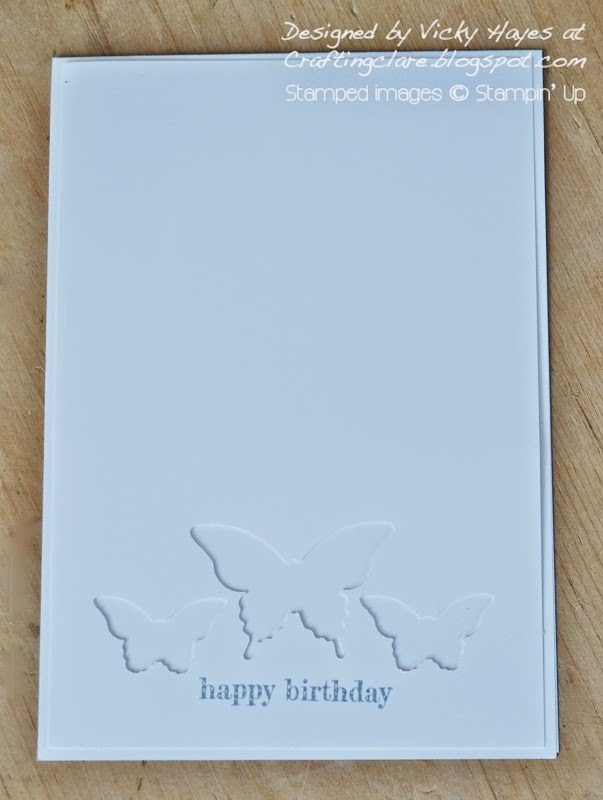 This is a fun card to make, with its recessed stamped butterflies and that central one with the fun dimensional feature. It's easy peasy too thanks to the coordinating punches! 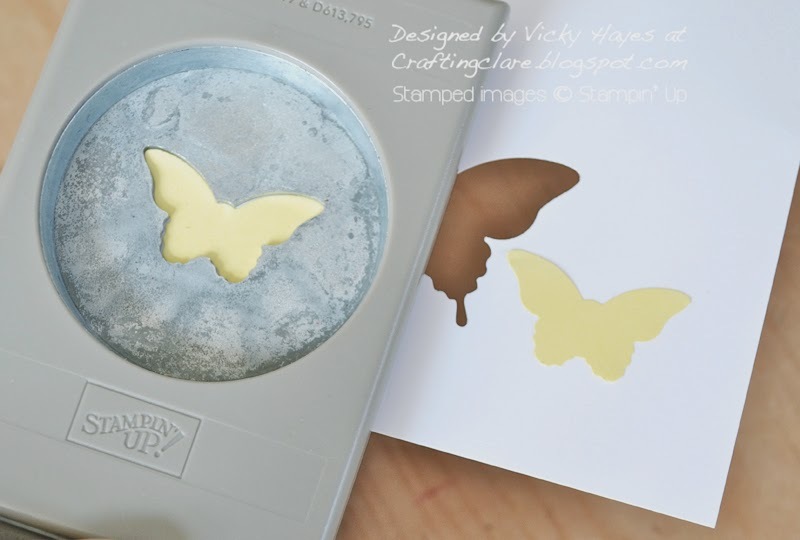 ... then stamped two of the small butterflies onto sticky notes, positioned them on each side of the central butterfly shape and punched those out too. I added the sentiment at this point, using my stamp-a-majig to make sure it was where I wanted it. The panel was fixed temporarily onto the card base. TIP: If you leave Tombow to dry before sticking, it turns into temporary glue. 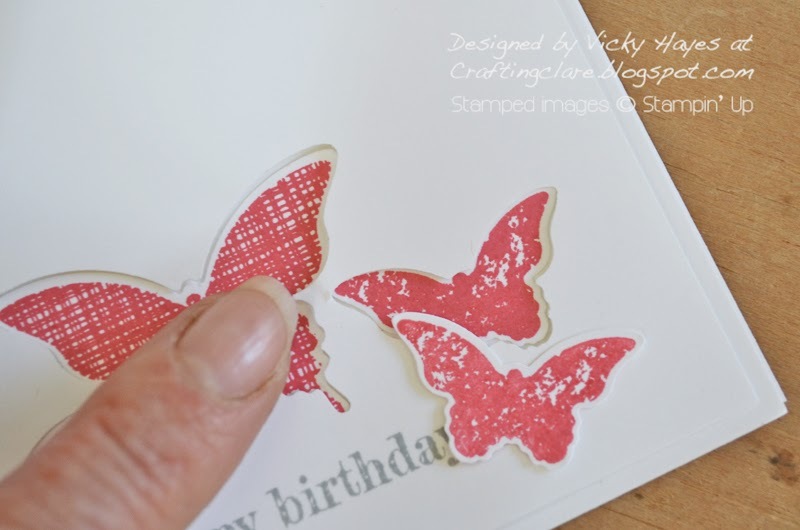 Next I stamped two each of the butterflies with Strawberry Slush ink and cut them out with the punches. After applying glue, I pressed one of the large butterflies into the central hole on the panel and repeated the procedure with the small ones. The panel was carefully peeled away and then repositioned using dimensionals. I love the recessed look! The spare butterfly was given a linen thread body and antennae and mounted on top of the central recessed one using glue dots. I hope you enjoyed the tutorial! I think it's all quite clear but if you have any questions just let me know. I based this card on this sketch at CAS(E) this Sketch, which I flipped upside down. So why are butterflies called butterflies? Were they all yellow once? Did they flap about in the butter?I've just had to look it up and the most beguiling answer is that they were believed to be witches, disguised so that they could steal milk and butter. The most ridiculous answer is that they taste like butter and they fly! Good Grief! I can't say I've ever eaten a butterfly, so as to what they may taste like, well, that will have to remain a mystery! Your three lovely recessed butterflies would never stay still long enough and so would never be on anyone's menu! Very sweet, I must say! 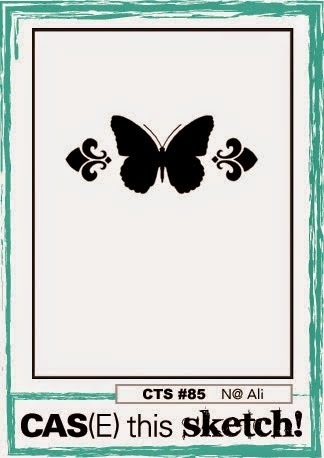 Very much to my taste Vicky, the card NOT the butterfly. Simple but very efffective. 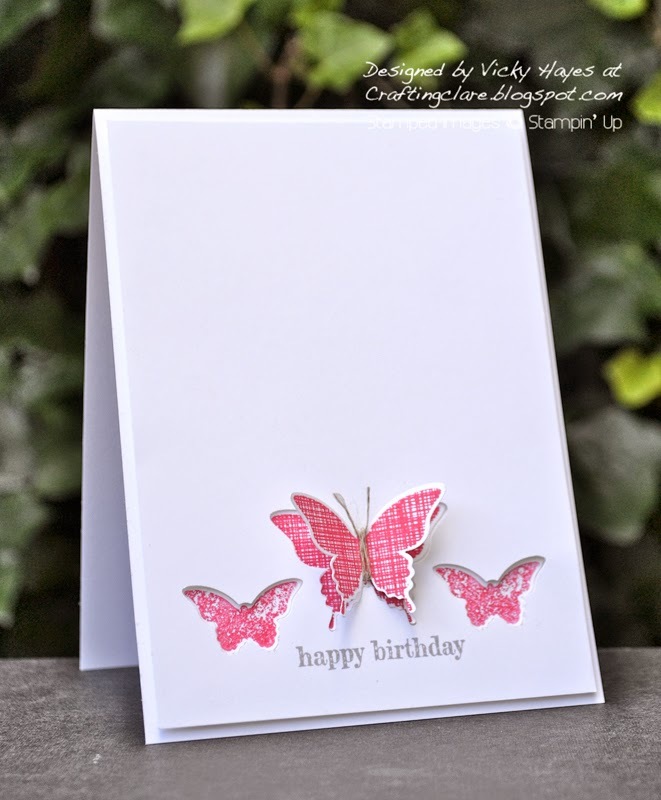 Brilliant tutorial and FANTASTIC butterfly card. Will probably CASE this one if okay with you!? Oh, this is gorgeous! Wonderful take on the sketch! Wonderful card. The tutorial is so nice and clear. I sometimes struggle with directions since the accident. I think even I could give this a try! i especially liked the linen thread on the raised butterfly. So pretty! Wonderfully CAS.....just perfect for CTS #85!